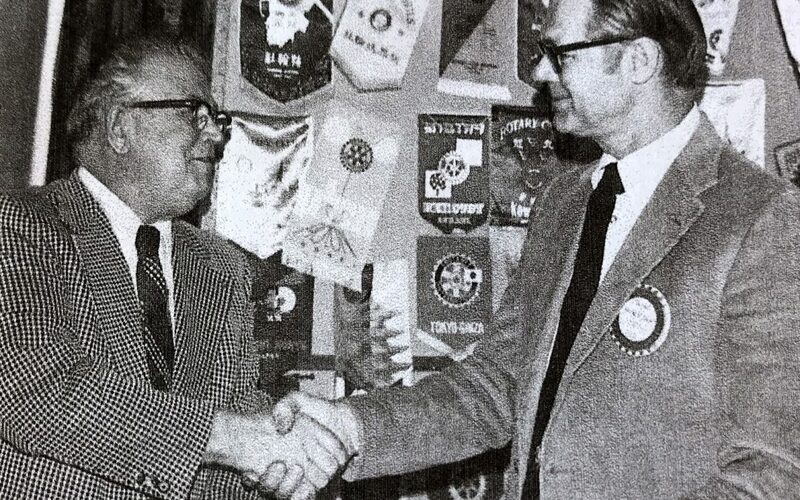 In 1971 and 1972, Boulder Rotary President Harold Short turned the club’s attention to supporting The Rotary Foundation, a charitable arm of Rotary that was started in 1917. 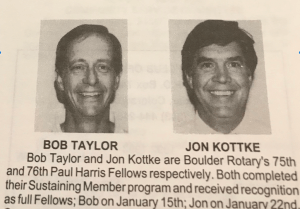 In 1975, Harold became the first Boulder Rotarian to become a Paul Harris Fellow. That recognition, named for the founder of Rotary, had been started by RI in 1957 to honor those who contribute $1,000 to the Foundation. Boulder Rotary’s support for the Foundation surged after that, as it did around the world. Doc Evans of Boulder Rotary received a Rotary district service award in 1984 for his efforts on the part of the foundation. Doc, who joined BRC in 1980, had been awarded a Foundation Scholarship in England, and used it as a graduate student at CU. Then, after receiving his doctorate from the University of Wales, he returned to Boulder to work in his field of radio astronomy. In recent years, Michael Weatherwax, a past president and past secretary-treasurer of BRC, has generously donated matching funds to help dozens of Boulder Rotarians become Paul Harris Fellows. Michael provided the following information about our club’s giving to the Rotary Foundation. Of our approximately 220 members, 152 have made some donation ($20+) to The Rotary Foundation. Of those 152 donors, 123 are PHFs at some level, PHF to PHF+8. Many donors also go on to contribute even more. We have 15 major donors who have each contributed $10,000 or more to the Foundation. As of October 3, the total all-time giving by our club to the Rotary Foundation is more than $1.5 million.